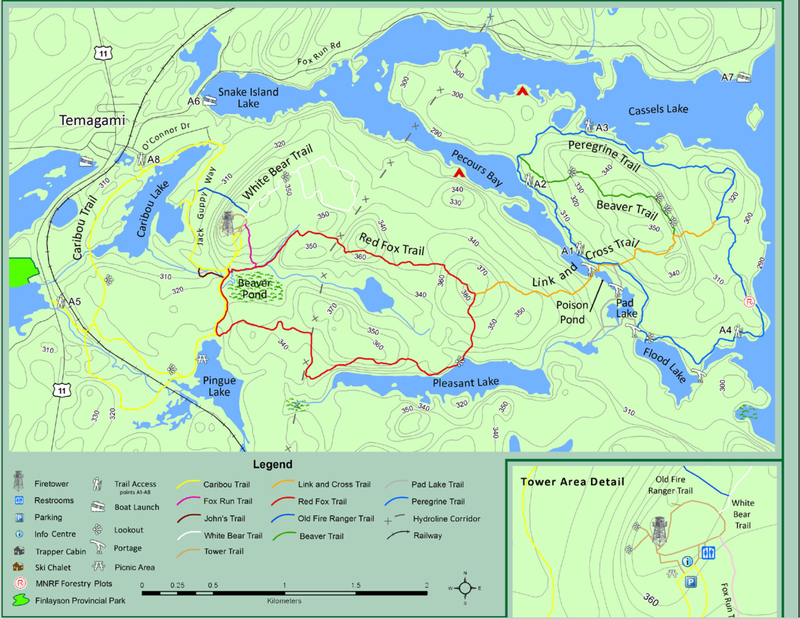 The Temagami Wilderness area is a vast, 16,000 square kilometre tract of land in Northeastern Ontario. Its boundaries are loosely defined by the town of Sudbury to the southwest, the town of North Bay to the southeast, the Ottawa River to the east, the Montreal River and the hamlet of Matchewan to the north, and the Wanipitei River to the west. So how do these forests survive? 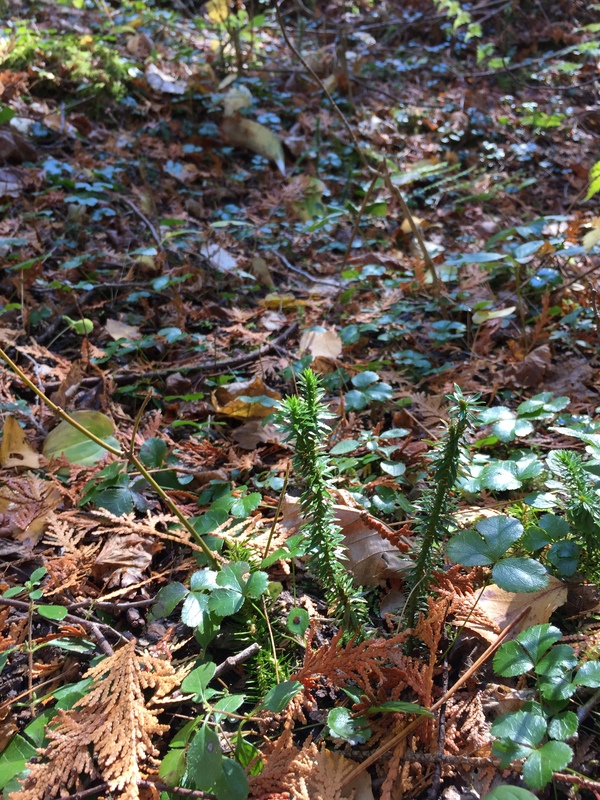 What makes old-growth pine so special? 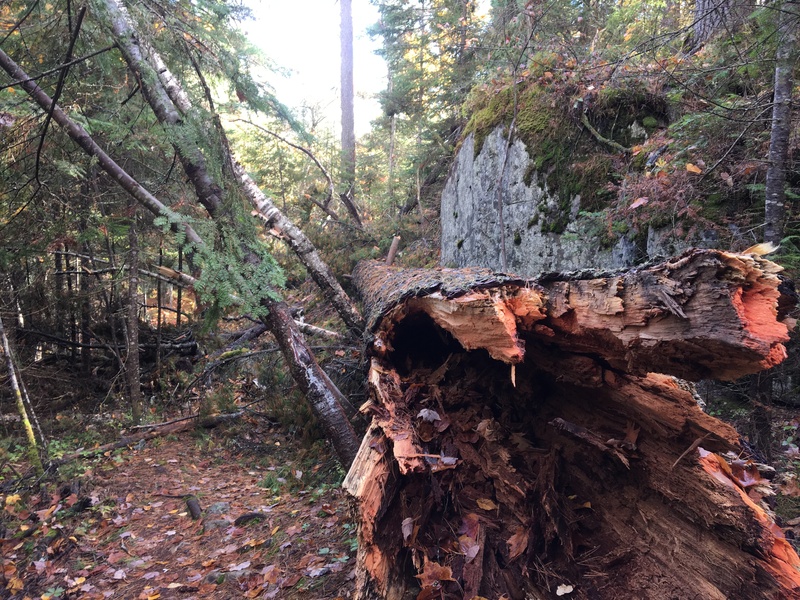 To find out, I’m taking a closer look at the life and death of one tree in particular, located in the White Bear Forest just outside the town of Temagami. The White Bear Forest was initially spared the logger’s axe by, ironically, a lumber company. The Gillies Bros. lumber company won the rights to log 500 square kilometres of forest surrounding the town of Temagami in 1928, yet decided to keep 2000 acres in its natural state for the enjoyment of the company’s employees. It probably didn’t hurt that the White Bear Forest was directly situated across from the home of the mill owner, who liked the view. The Ministry of Natural Resources drafted another logging plan for the area in the 1980s, which was opposed by environmentalists and locals alike. In 1996, the White Bear Forest was designated as a conservation reserve. Left in its natural state, the White Bear Forest has been quietly regenerating for thousands of years. The oldest known pine tree is approximately 400 years old, which means it would have been a sapling when Samuel de Champlain first made contact with the local Aboriginal groups near Lake Nipissing. 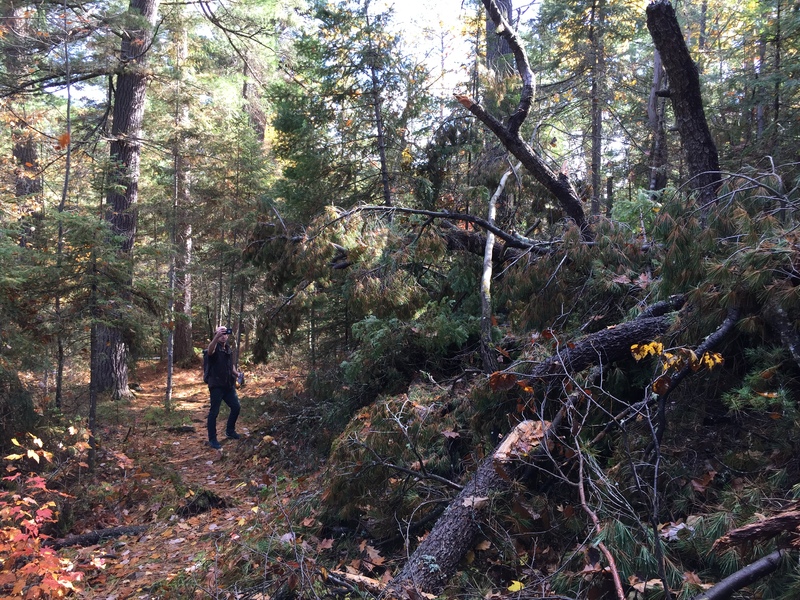 I wanted to learn more about the life and death of this giant, so following the Friends of Temagami Annual General Meeting on October 16, 2016, I set out on a hike through the White Bear Forest to see the carnage for myself. 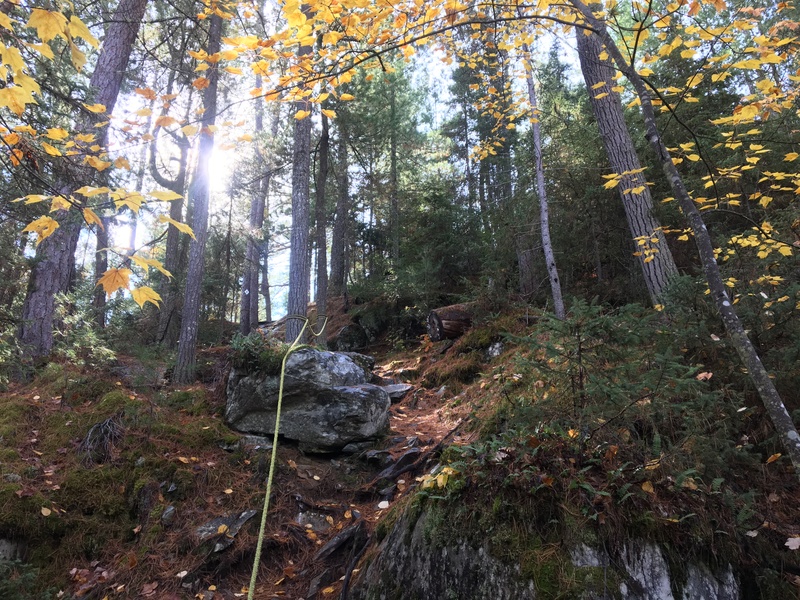 The ancient fallen white pine is located a short walk down the White Bear trail, past a steep section that requires the use of rope handholds to access. At the bottom of the hill, the toppled giant comes into view. According to Michael Henry of Ancient Forest Exploration & Research, this tree was approximately three quarters of the way to its natural life expectancy. 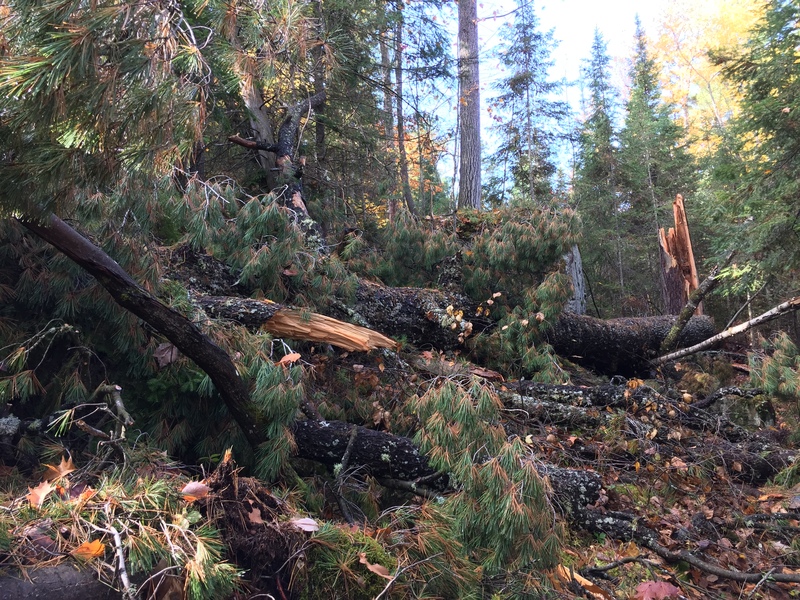 At over 100′ tall and 10’5″ circumference at “hugging height”, this pine knocked out several smaller trees as it crashed to the ground. 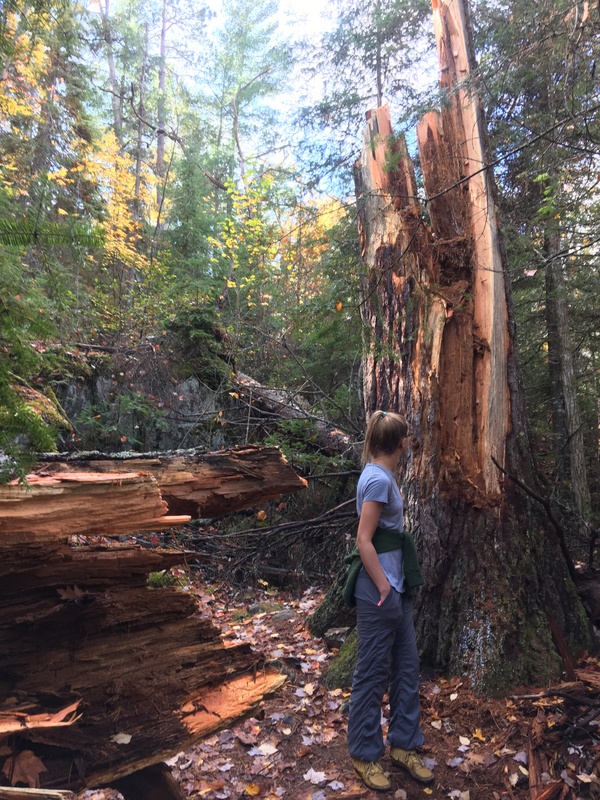 Although it seems sad to lose such a large, old tree, this is but one of the natural processes that contribute to an old-growth forest ecosystem. A self-regenerating old-growth forest can contain fallen logs that have been decomposing for hundreds, if not thousands of years. So what does this mean for our dearly departed tree? What happens now? Because the White Bear Forest is left to regenerate, the tree will remain where it fell. 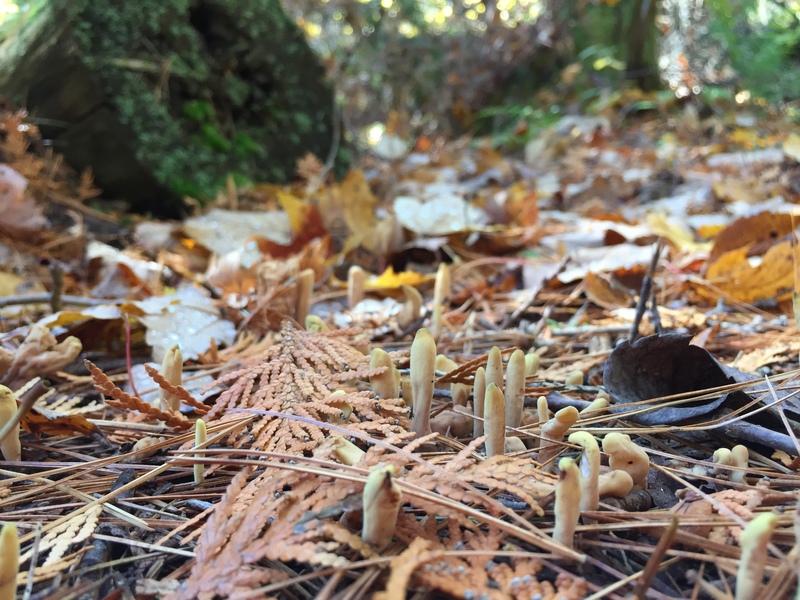 It will be colonized by fungi, lichens, and mosses. It will provide habitat to insects, birds, and mammals. The wood fibres will slowly break down over hundreds of years, adding nutrients to the soil. The clearing of the canopy caused by the tree’s fall will open up the forest floor to more sunlight, allowing smaller trees to grow. If left alone, perhaps 400 years from now another giant white pine will take its place and the cycle will begin anew. 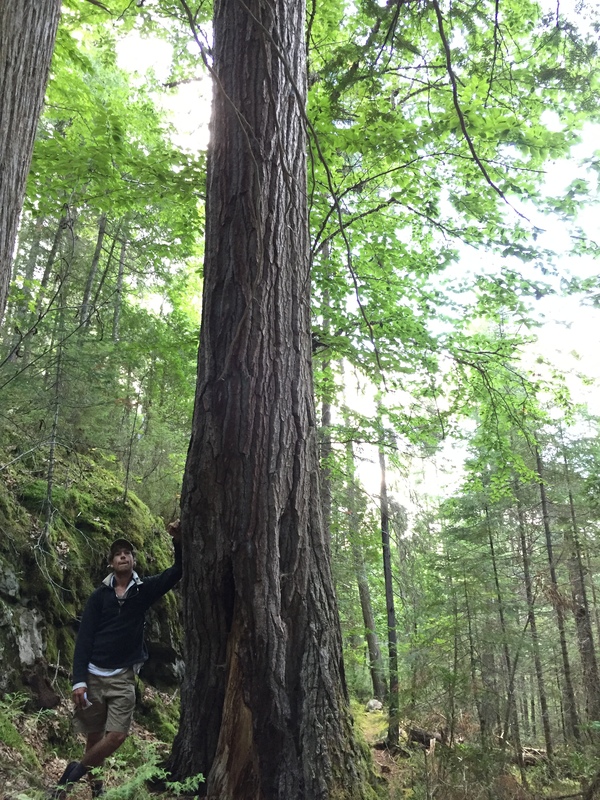 Old-growth forests are about more than just big trees. 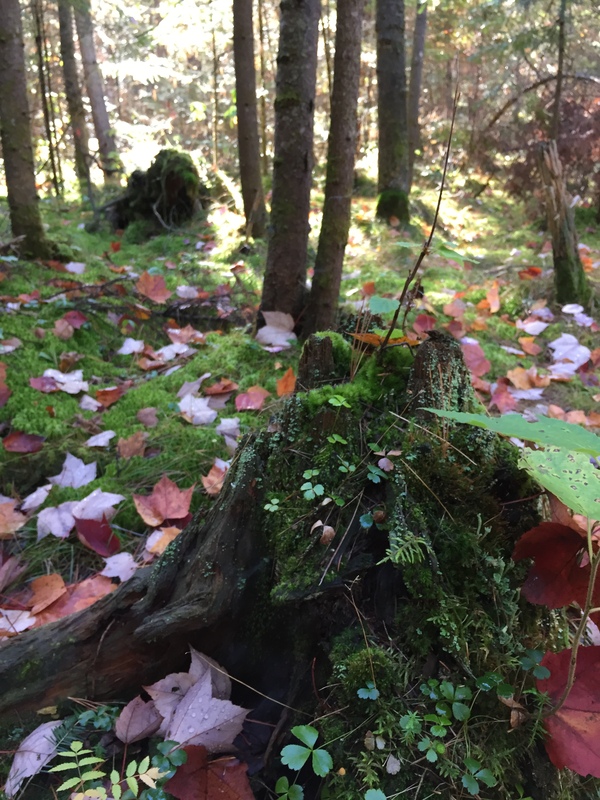 Fallen trees can remain on the forest floor for centuries, adding to the rich ecosystem of these self-sustaining forests. The death of this tree will help to nurture generations of red and white pines, as long as humans can resist the urge to cut them down. About the author: Tierney Angus is a first-year journalism student at Humber College in Toronto. She is an avid canoeist, tree-hugger and adventurer. She recently spent 17 days travelling through Temagami by paddle and portage in August, 2016, with her canoe and life partner Andrew Bell. She is an active member and on the board of directors of the Friends of Temagami, a non-profit, 100% volunteer-based organization that aims to protect, preserve, and promote eco-tourism in the Temagami wilderness area. If you would like to learn more about the Friends of Temagami and their efforts to conserve the old-growth forests of Ontario, please visit their website at friendsoftemagami.org, or follow Tierney on her blog at deepoceanmediasetup.ca/thehappyadventure or on Instagram (@tear_knee and @friendsoftemagami). Unless otherwise noted, all photos, videos, and multimedia elements are the author’s own.